While the ever-prevalent 3rd Generation Glocks can be purchased more readily than 4th Generation models, many including myself have opted for the current generation. With their introduction at the 2010 SHOT Show, consumers were shown a Glock that still retained pretty much everything of the prior generation but with some updates. These updates included a redesigned RTF-like grip texture as standard, a new default grip size (in 3rd Gen terminology it is an SF form factor), backstraps to change from the default SF to a medium grip size (normal grip size in previous models), or to a L (large) grip size . When comparing mechanical differences of the 4th Generation Glocks to prior generations, most notable is the use of a captured spring RSA (recoil spring assembly). The ejectors have remained the same for most using the 336 style ejector but the extractors have been changed to ones with a “dip” visible from the side. While Glock has not acknowledged any problems with the new extractors or ejectors, the RSAs were indeed labeled as problematic. Thus, in Sept of 2011 Glock began offering customers the ability to voluntarily change out their earlier version RSAs to the current ones. You can find out more about that by contacting Glock customer support via phone. The problem that largely prompted the change in RSA design was claims of severely erratic ejections from 9mm Glocks including later 3rd generation guns and 4th generation models. Again, this has only been reported in the 9mm Luger models. I had been able to find a new G19 locally via a private seller and was quite happy with the price. After doing some research it seemed a G19 would be a great carry piece for me and so I bought it. The test fired casing packet was dated August 26th, 2011. My pistol had the 0-4-3 RSA, a dip extractor, and the 336 ejector. Immediately after buying it I went out and put about 300 rnds of mixed 9mm Luger through the pistol. Ammunition I used was WWB 115 gr, DC Ammo Co. re-manufactured ammo leftover from the 90s (had been quite consistent in the CZ-85B I shot most of it through), Speer Lawman 115 gr TMJ, and some Federal 115 gr FMJ. First shot I put through the pistol using WWB hit the steel plate I was aiming for from 25 yards…but it also resulted in the pistol ejecting the spent casing directly into my forehead with some gusto. I had heard of this issue before and just kept shooting hoping that it wouldn’t happen again. Of the few hundred rounds I shot, most ejected casings landed within an area one foot out on the right of the pistol. Whereas at least a couple dozen either directly beamed me in the forehead, my glasses, or glided through the hair on top of my head. I tried all three of the magazines I had and the issue remained mostly randomized and happened with all ammo types I had with me. To put pictures to words, here is the best video I have seen on the issue. This is from user Hmac on m4carbine.net posted under his presumed youtube account name of HMac411. Now that you can see those expended pieces of brass flying into the camera, imagine that as you’re trying to put rounds downrange. It’s not predictable and it surely will throw you off more than proper extraction ever will. Quite frustrated that my new pistol was behaving erratically despite me using proper grip, good ammo, and having cleaned and lubricated it before firing, I set out to find out the cause of its ailment. 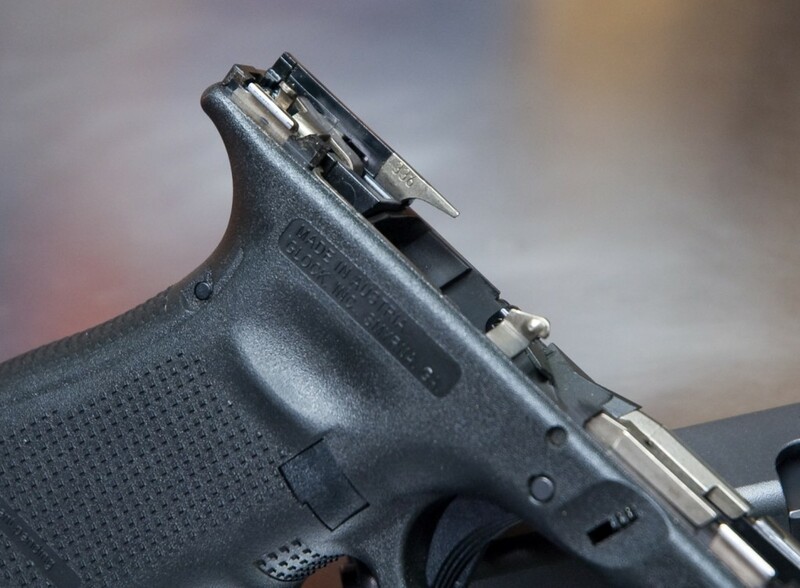 After some online research I came across several forums catering to pistol shooters and Glock fans in which the consensus stated the 336 ejector was at fault. Most recommended updating the ejector to the 30274 ejector which was current. I could not buy the 30274 ejector online at the time and was left with the option of sending my pistol into Glock for repair. The phone call with Glock happened twice. First call the rep courteously informed me they could not sell the 30274 ejector directly to me; I had to be a certified Glock armorer to receive the part. Since I am not a Glock armorer I have the option of having the part sent to someone who is and getting it from them. So I asked where I could find a Glock armorer and the rep said I had to do that myself as Glock didn’t have a directory to look these people up. After that call I searched around online trying to find any Glock armorers who publicized themselves in my area. In my search I found one who was about 1.5 hrs away and after a phone call with them, they didn’t have the option to even order in the specific 30274 ejector or trigger housing assembly that contained it. My options were reduced to sending my G19 into Glock for repair. Glock sent me a prepaid shipping label for FedEx along with shipping instructions and the process was very easy. On the form accompanying my pistol I stated I was experiencing brass to the face and erratic ejection and also wanted the ejector updated to the 30274 ejector claimed to be the cure by internet posters. I took the pistol out to my range and put about 7 or 8 mags through. Right away I noticed something: I was able to keep shooting without having a piece of brass smack into my face as if Randy Johnson had an identical brother born as a Glock 19. However that breath of fresh air did not last long as on my next outing with the same ammo brands (WWB 115gr FMJ, Speer Lawman TMJ 115 gr, Federal 115 gr FMJ), nearly every mag through the gun caused at least two incidents of brass to my face. Typically it was either the first or second round of the mag or right in the middle of the mag when I would get either brass directly into my forehead, or just sliding through the hair at the top of my head. So the gun still isn’t working…but what else is there to fix? After some research on m4carbine.net, glocktalk, etc, I found some experienced voices stating their findings. The common consensus was that with the recent 3rd gen and most 4th gen Glock pistols, Glock has switched to a MIM (metal injection molded) and while this manufacturing method should have absolutely no effect to the reliability and function of the component, the “dip” extractor (MIM) as it’s called has been labeled a culprit. Now keep in mind that while I’m talking about being beamed in the face with brass, the gun still shot 100% over the approximately 700 rnds I fired…it just didn’t seem to care that a human being was using it. As you’ve been reading, the blame has gone from the RSA to the ejector and now it’s on the extractor. Is there light at the end of this tunnel? Here is a list of solutions I have found from owners and industry professionals. Lone Wolf currently makes extractors that are machined as opposed to MIM. Machined versus MIM should not matter at all if you understand the manufacturing process, but if that MIM one happens to be made incorrectly, it surely will cause issues. Some people have reported that this extractor change has alleviated issues. While not aftermarket, it has been reported that parts-stocking companies such as Brownell’s have OEM Glock 9mm extractors which are of the “non-dip” variety being sold on their website a “New Style” and “Old Style” (new style being the “non-dip” supposedly). Several other people have reported this on m4carbine.net, glocktalk, etc as being a working solution for them (in the rounds that they have fired so far). In addition, APEX Tactical most known in my opinion for their excellent aftermarket support of the S&W M&P line, is in the process of moving to their new location and has been working on an extractor solution of their own. The Apex Tactical extractor is currently in testing and has been reported to be a 100% fix for the issue. I would recommend this step prior to paying money for a new extractor. Basically stone the top and bottom of the extractor and then polish it. A friend of mine has done this and reports it has worked so far in four separate Glock 9mm pistols. After experiencing the same problems I had from when before I had sent the pistol in the first time, I called again. I asked the representative if it was a known problem and if I sent the gun in, what would be done. The representative went on to list factors that could cause it for me including LIMP WRISTING, BAD AMMO, and possibly something wrong with an internal mechanism of the pistol. I again asked if this was a common problem (look on any Glock forum and it’s like discussing the weather anywhere else) and he said “no.”. This isn’t a big surprise. Yet despite Glock not taking an official stance on this problem, people who have sent their guns in lately have posted that they’ve either received a brand new pistol, or combinations of extractor/ejector/RSA have been changed. If you plan on sending your gun in, don’t take a stone to your OEM extractor because I imagine Glock will notice. Despite the reasonable conclusion that brass ejecting into your face is a bad thing, there are people who’re quite fine with this and would call it an inconvenience at best. Despite my feelings that those people are silly, those people have money and are willing to pay for your gun. You could use this money to buy an older Glock 19 that is free from this issue, or another pistol. Personally I don’t care for continuous fiddling with a pistol that is marketed as “perfection” and so I sold mine with full-disclosure of the problem. In conclusion I do not dislike Glock pistols. I did feel it was bad for Glock to not take an official stance on the issue and from that I don’t like Glock as a company. Like Glock pistols, not Glock company. Make sense? As I said before, the erratic ejection problems are isolated to 9mm Luger models so far. I have no qualms with buying a Glock 4th or 3rd Generation model in .40 S&W or another caliber they offer. 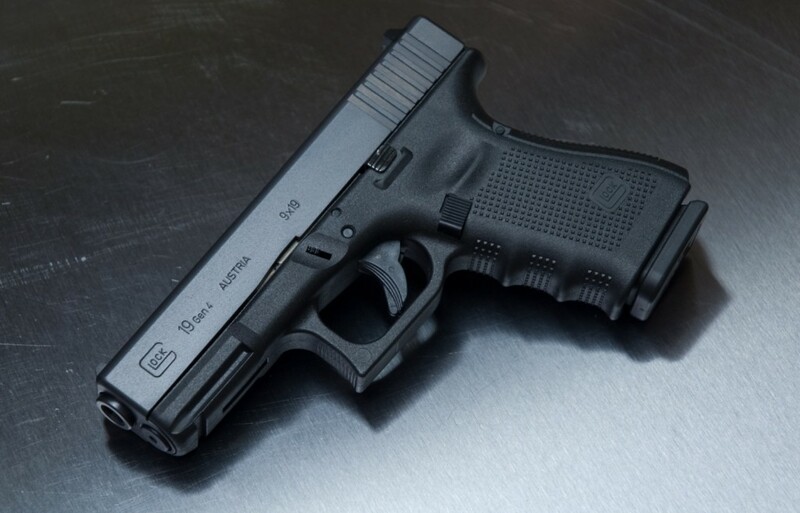 I would also gladly purchase an early Generation 3, 2, or 1 9mm Glock pistol if I was still looking for a gun to fit the role a G19 is aimed for.